using range in selection screen in username field? Jul 20, 2017 at 09:19 AM | 66 Views | Last edit Jul 20, 2017 at 12:43 PM 2 rev. i wanted to use range in username field in selection screen. i have three username use as a input. when we enter range between amjad or rehan.anjum so output is correct.but when we enter range between amjad or zeeshan then output is coming not correct. In second scenario output contains only amjad or zeeshan but in output rehan.anjum are also shown in output. Actually i wanted to enter amjad in first input and zeeshan enter in second input so in output show only amjad and zeeshan username but in output shows amjad and zeeshan in output and also shown rehan.anjum in output.join in okay and other fields are okay but i cannot understand where is problem. The problem is because you are using this two blank fields, the program do one between in the two names. You are entering with letter A in the first and Z in the second, all names that start withe letters between A and Z also be returned. in the select screen click on the arrow and put each value in the Select Single Values. 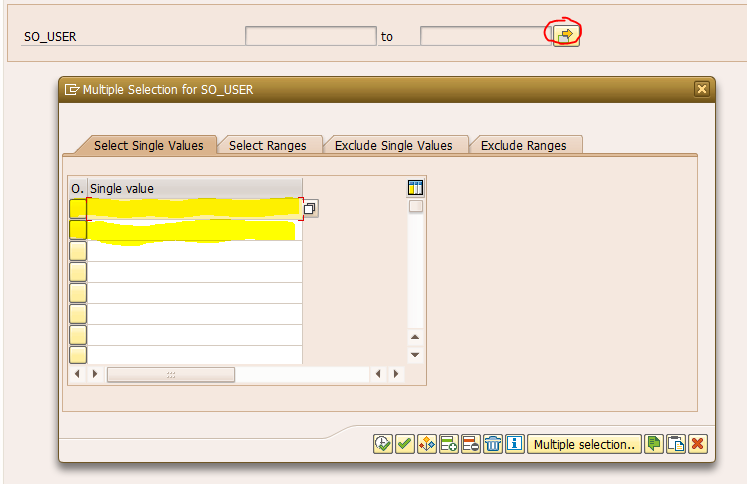 In this way, the select search for each value, and dont do the between.